An independent, family owned business, JACK’S is rich in the tradition of hard, honest work providing RENTAL, SALES & SERVICE to Homeowners, Commercial and Residential Contractors, Electricians, Plumbers, Pipefitters, Landscapers, Mechanical and Industrial customers in the Chicago-land area since 1965. JACK’S, Inc. was started by Robert T. Jacklin, Jr. and his wife Betty in 1965. 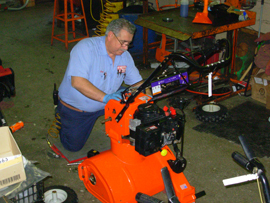 The tool rental business was a fairly new concept in the Chicago-land area but it caught on quickly and within a couple of years Jack’s grew rapidly. In addition to the rental business, JACK’S expanded into sales and service dedicated to lawn & garden, construction, industrial and mechanical markets. The combination of rental, sales, and service along with the Jacklin family work ethic launched what is one of the most rapid and best known small business success stories in the greater Chicago-land area. 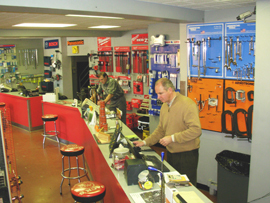 Providing the best single source around for equipment and tools in the Chicago-land area. We’ll save you time and money by simplifying all your SALES, SERVICE and RENTAL needs in one visit. Greeting you with a handshake and offering expert advice to make sure you are using the right equipment or tool for every project or job. Delivering instant customer service from knowledgeable associates and, making sure your equipment is serviced and maintained by factory trained technicians so you and your equipment can get back on the job.